This month at Gettysburg Flag Works, we’re proud to be celebrating our 25th anniversary! We’ve been providing high quality, American made products to our clients and customers for a quarter of a century – and we’ve come a long way since our humble beginnings! As part of our anniversary celebration, we took a few minutes to chat with our founder, Mike Cronin, to talk about where we came from, what makes us who we are, and where we’re headed in the future. Tell us about the beginnings of Gettysburg Flag Works. How did you get started? Like a lot of folks, I heard through the grapevine that layoffs were coming. President Clinton was elected in 1992 and severely cut defense spending. I had started selling flags in 1993. When I was eventually laid off from a local defense contractor in 1996, I decided not to continue in materials/metallurgical engineering. I had acquired 15 repeat customers by 1996 and was encouraged by Unemployment Office to consider selling flags full time. So I did. What inspired you to start Gettysburg Flag Works? An acquaintance of my wife overheard that I might get laid off, he sold flags on a very small scale locally, and asked if I would consider selling for him. It took a little persuasion, but eventually I gave in as the layoff began. So I applied for a DBA in 1993. How did you come up with the name ‘Gettysburg Flag Works’? My wife’s acquaintance was a history major in college. He came to my house with a list of battles on American soil. We got to the “g’s” and stopped at Gettysburg. Pennsylvania work ethic, Abraham Lincoln, the significance of the battle of Gettysburg, Emancipation Proclamation. The bell rung in my head. When did the business really take off? I began with the DBA in 1993, and was laid off in December of 1996. The decision not to continue in engineering was made, and starting on Dec 10, 1996 I worked 365 days straight 10-12 hrs per day. Being an entrepreneur was very enjoyable. What are some of your favorite projects that your team has tackled? The 100 foot flagpole at Trustco Bank headquarters in Scotia. Things that take thought and creativity. 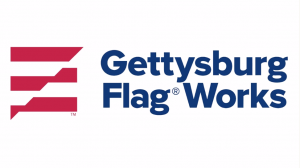 Do you have a favorite Gettysburg Flag Works product or type of product? If so, what is it and why? My favorite would be the custom wood floor bases. They are beautiful and we enjoin local artisans to manufacture our designs. What are some of the best things you’ve learned through selling American flags? People love the flag. People of all races, creeds, ages, backgrounds, etc. It’s amazing to learn who really holds the flag sacred and stands with pride in her shadow. What is your favorite memory of selling American flags? There are two types of memories, sad and happy. The sad ones are when a deceased veteran’s spouse or children come in for a case to enshrine the flag from the funeral service. I always tear up and share a little in their grief. The happy ones are associated with installing flagpoles to raise a flag in a new location, hoisting the colors high. Do you have any favorite stories about the business you’d be willing to share? I often tell this true story. After my wife’s acquaintance finally convinced me to help him sell flags and I established Gettysburg Flag Works on May 26, 1993, nothing happened for a week. I was still going to my “day job” as a metallurgical engineer. I had opened and closed a business with my brother, John, lost some money, and so my wife Anne was less than encouraging to start another business. So on the first Monday in June of 1993 we laid in bed and prayed that if God wanted me to sell flags, then I would sell one flag that day, and if I didn’t, I would stop. That day I went into work and had to take a fractured turbine wheel to a local lab for inspection. The lab manager, Tom, and I were discussing the loss of business, government cutbacks, etc. and I told him that my wife’s acquaintance had roped me into selling flags. Tom inquired about the flags. I had one catalog in the trunk of the car, and he insisted on seeing the catalog and ended up ordering two flags, one for his mother, the other for his mother-in-law. I called Anne to tell her the news. She was not pleased. So I said that Tom bought the flags, I didn’t exactly sell them. On my way home, I decided to stop at a neighbor, Joe, who had a flagpole with very worn flags and told him I had stated selling flags. I asked him if he would like to “update” the worn flag on his flagpole. I sold Joe two flags, a US flag and an Army flag. That was the answer to our morning prayer and the rest is history. In your opinion, what sets Gettysburg Flag Works apart from other flag companies? You’ve heard it before, great customer service sets companies apart from their competitors. We strive for that each and every day, from taking the order to final delivery and in handling any customer/product issues openly and fairly. What does it mean to you to be celebrating 25 years at Gettysburg Flag Works? I never dreamt of being this successful. I still don’t quite understand it. But it is heartwarming to know that the business is alive and continuing to grow. 25 years is an impressive milestone. What’s the secret to your ongoing success? You must continue to grow to be successful, even at a slow pace, but grow you must in a retail market. Selecting the right mix of products and focusing on the right customer base for those products is essential. Hiring the right people, with the right fit in the team environment, and getting out of their way, letting them do the job you hired them for. What are you doing to celebrate 25 years in business? Resting, traveling, playing with the grandchildren, sailing, golf, and enjoying the fruits of my labors. What is your favorite memory from the past 25 years at Gettysburg Flag Works? I love installing new in ground flagpoles on peoples’ lawns. So often they come out and watch with anticipation. The flagpoles are often erected to honor a close relative (son or daughter) who has enlisted or graduated from ROTC or military academy. A lot of veterans raise the flag out of pride for our country. It always brings a smile when the first flag is raised on a new pole. What are your hopes for Gettysburg Flag Works in the next 25 years? Continued growth, increasing customer base, perhaps some innovative products. Happy customers, vendors, and especially employees. Is there anything else you’d like to share with us about the past 25 years at Gettysburg Flag Works? Let’s not forget what makes Gettysburg Flag Works great: the employees and managers, and what they do on a day to day basis keeps it working smoothly. A BIG THANK YOU to and current and past employees and managers for a job well done! We’re offering some great deals and discounts to celebrate all month long. Make a purchase and celebrate with us! In the market for a new flag or flag-related product? Shop our wide selection now! We’ve even put together a list of our top 25 most popular products to make shopping for what you need extra easy. Check that list out here! Want to be the first to know about our promos, new products, and more? Join our mailing list here, and be sure to check out our Facebook page for up to date details and the latest on our anniversary promotions and deals!